On Friday, October 14, The Washington Group (TWG), in conjunction with the Johns Hopkins University School of Advanced International Studies (SAIS), hosted an "After the Orange Revolution: the U.S. and Ukraine" presentation. The speakers included David Kramer, Deputy Assistant Secretary for European and Eurasian Affairs at the U.S. Department of State, and Taras Kuzio, visiting professor at The George Washington University. The event was held at 7:00 p.m. at SAIS in Washington, DC. Moderated by Orest Deychakiwsky, Staff Advisor at the U.S. Helsinki Commission, the panelists assessed the contemporary situation in Ukraine, analyzed the effects of the Orange Revolution, and commented on the direction of U.S.-Ukraine relations for the near future. As the evening's first panelist, Kramer highlighted the importance of the Orange Revolution, Ukraine's continued democratization, and its integration into Euro-Atlantic structures. Kramer explained that "The Orange Revolution has radically transformed the political dynamics in Ukraine. And it also had and still has significant ramifications for the whole region. All of us, not least the Ukrainian people, have a stake in Ukraine's continuing democratization and success, the development a market economy and rule of law and integration into global economic institutions and the Euro-Atlantic community." Kramer remarked on his most recent trip to Ukraine with Anthony Wayne, the Assistant Secretary of State for Economic and Business Affairs. During the visit, the U.S. delegation met with Ukraine's government officials, including the Prime-Minister Yuriy Yekhanurov, Presidential Secretary Oleh Rybachuk, Foreign Minister Borys Tarasyuk, Secretary of National Security and Defence Council of Ukraine Anatoliy Kinakh, and the Finance and Deputy Economic ministers. Meetings were also held with former Prime Ministers Tymoshenko and Yanukovych, former State Secretary Zinchenko and Verkhovna Rada (Ukraine's parliament) deputies from a number of different factions. According to Kramer, during their meetings with Ukraine's officials, the U.S. delegation delivered a consistent message that the United States continues to support Ukraine's reform efforts and Euro-Atlantic aspirations. "For our part, the United States' part, we stay ready to help support development of democracy, to help in anticorruption efforts and forward economic reforms. We'll cooperate closely with the Ukrainian government across a wide spectrum of issues. The joint statement that the two presidents, President Bush and President Yushchenko, signed in April focuses on concrete areas of our cooperation such as promoting democracy and freedom, fighting terrorism, supporting Ukraine's NATO aspirations and combating weapons proliferation and promoting economic reform. We also pledge to cooperate in fighting organized crime, trafficking in persons and other issues such as HIV/AIDS. We certainly have a full agenda with the Ukrainians," announced Kramer. The Deputy Assistant Secretary pointed out that it is also necessary to remember that Ukraine has made significant progress since this past January. "The media operate more freely, respect for civil rights has improved and the court has become more independent", stated Kramer. Commenting on the recent Ukrainian political turbulence, Kramer said that "no country has made the transition from communism to democracy and market economy without ups and downs. So, we need to have realistic expectations and to keep helping to steer Ukraine in the right direction. We [the U.S.] also said that there is a very urgent need to regain the momentum on vital economic reforms and to redouble efforts to combat corruption." During meetings with Ukraine's officials, the U.S. side also stressed the need to set side personal animosities, and to cooperate on issues that are vital for Ukraine's future. Following Kramer's presentation, Kuzio analyzed the recent events in Ukraine, the public reaction to them, as well as the overall trends in contemporary Ukrainian politics. According to Kuzio, it is incorrect to assess the recent crisis in Ukraine from two maximalist viewpoints - to either ignore it, or to emotionally exaggerate that the Orange Revolution has been betrayed. Ukraine's politics is also too complicated to blame only one side (usually Tymoshenko) for creating the crisis. Blame is to be shared between Yulia Tymoshenko and Viktor Yushchenko. Eight positive developments are currently taking place in Ukraine since the Orange revolution, explained Kuzio. Firstly, although the new government is a mismatch of various political factions, the new guard, unlike its Kuchma-era predecessor, is not pursuing violent means against those who oppose it. Secondly, the Orange Revolution has empowered young people and reinforced civil society. Thirdly, there has been a great increase in media freedom. Fourthly, law enforcement is being brought under democratic control and corruption attacked. Fifthly, according to Kuzio, there is a positive trend in that Ukraine is moving away from Eurasia's and the CIS's super-presidential system to a European, Central-European system. "Of the 27 post-communist states which have undergone democratic transition since 1991, the most successful have been those with parliamentary systems in Central Europe, not a presidential system. Ukraine is moving in its reforms towards the Central-European, Baltic model. And that's a good thing," said Kuzio. Sixthly, Kuzio continued to point out that the political spectrum of Ukraine is radically changing, with the Centrist camp in an even worse mess than that of the Orange coalition. The Communists are on the decline. Seventh, corruption is beig dealt with, but not as much as one would have hoped. Finally, Russia and Ukraine's paths are diverging. But, there are also areas to criticize. Overall, Kuzio believes that President Yuschenko has traveled abroad too much, and the Ukrainian diaspora in the United States should not have encouraged his most recent trip to America. Instead, Yushchenko should have focused more on Ukraine's domestic political crisis and getting his candidate for prime minister through parliament in the first attempt. Also, signing the recent memorandum with former Prime Minister Yanukovych was a strategic mistake. 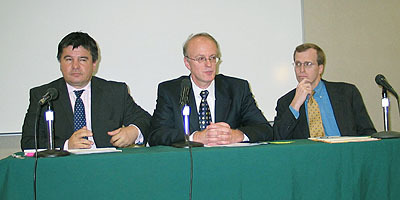 Both Kramer and Kuzio agreed that the upcoming March 2006 Ukrainian parliamentary elections are crucial for Ukraine's future. Because of Constitutional reforms, the next parliament will be extended by one year, until 2011. "During that time basically Ukraine's fate is decided in terms of NATO, WTO and the EU. That's why Yushchenko has to work hard for the next few months," said Kuzio. A question and answer period with the audience followed the discussion. Questions were asked about corruption in Ukraine, Ukraine's perspective membership in the WTO and the EU, Ukraine's treatment of the country's Jewish community, the problem of Ukraine's graduation from the Jackson-Vanik amendment, and the media situation in Ukraine were of special interest. With regard to the Jackson-Vanik amendment, both speakers confirmed that the Ukrainian government has made significant progress in this area throughout the years, and that the U.S. Government supports the graduation of Ukraine from Jackson-Vanik. Taking into account the positive achievements of the Orange Revolution, the speakers were generally positive about the medium-term prospects and possibilities for Ukraine's future. However, they expressed that the future will depend on the success of Ukraine's government policy and economic reforms which have been slowed recently and request the attention of President Yushchenko. With almost every seat in the SAIS Rome Auditorium occupied, the event was very well attended. Among the attendees were Steven Pifer, former U.S. Ambassador to Ukraine, Marcus Micheli, Senior Ukraine Desk Officer at the U.S. Department of State, and Eugene Fishel, Acting Division Chief at the Bureau of Intelligence and Research of the State Department. A reception followed the event.